Tulip is the common name for any member of the thousands of varieties and about 100 species of bulbous plants comprising the genus Tulipa of the flowering plant family Liliaceae. The term also is used in reference to the flowers of any of these plants, which tend to be colorful and often bell-shaped. With the showy flowers coming in such colors as white, red, brown, yellow, and deep purple, tulips are highly popular as ornamental plants for gardens, potted plants, and as cut flowers. While the flowers advance the tulip species' individual purpose of reproduction, they provide a value for human beings in terms of their prized aesthetic beauty. In the seventeenth century in the Netherlands, the enthusiasm for tulips lead to a period of speculation, known as "tulipomania," where the demand for particular varieties commanded enormous prices. 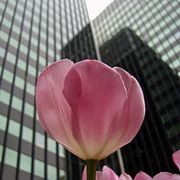 Tulips are common in urban landscaping, as seen here in front of an office tower in Ottawa. The Liliaceae, or Lily family, to which tulips belong, is a family of monocotyledons in the order Liliales. Plants in this family have linear leaves, mostly with parallel veins, and flower parts in threes. 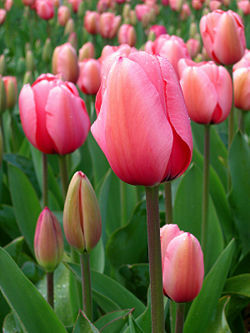 Tulips, comprising genus Tulipa, are perennial bulbous-rooted plants. A bulb is an underground vertical shoot that has modified leaves (or thickened leaf bases) that are used as food storage organs by a dormant plant. 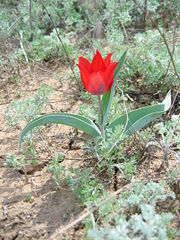 Wild tulip in the steppes of Kazakhstan. Tulips grow to 10–70 centimeters (4–27 inches) tall, and have a small number of strap-shaped, waxy-textured, usually glaucous green leaves clustered at the plant's base. The flowers are large with three petals and three sepals. The fruit is a dry capsule containing numerous flat disc-shaped seeds. Tulip species are native to southern Europe, north Africa, and Asia from Anatolia and Iran in the east to northeast of China and Japan. The center of diversity of the genus is in the Pamir and Hindu Kush mountains and the steppes of Kazakhstan. Some historical cultivars have had a striped, "feathered," "flamed," or variegated flower. While some modern varieties also display multi-colored patterns, this typically results today from a natural change in the upper and lower layers of pigment in the tulip flower. Historical variegated varieties—such as those admired during the wild popularity of the Dutch tulipomania in the seventeenth century—gained their delicately feathered patterns from an infection with a virus, tulip breaking potyvirus. The mosaic virus is carried by green peach aphids, Myzus persicae, an insect common in European gardens of the seventeenth century, in which peach trees were often a prominent feature. While the virus produces fantastically beautiful flowers, it also causes the plant to sicken and die slowly. Today, it has been largely eradicated from growers' fields. Although tulips are associated with Holland, both the flower and its name originated in the Persian Empire. The tulip actually is not a Dutch flower as many people tend to believe. Tulip, or "Laleh" as it's called in Persian, is a flower indigenous to Iran, Afghanistan, and parts of Central Asia. In the sixteenth century, tulips were introduced to Europe, and from there on it became known to the whole world. This part of the world is also the home of several other species of flowers and also fruits: Jasmine and orchids are just a couple of them. Peaches (Prunus persica in Latin), persimon, and parsley got their very names because of their Persian origins. It is unclear who first brought the flower to northwest Europe. The most widely accepted story is that of Oghier Ghislain de Busbecq, Ambassador from Ferdinand I to Suleyman the Magnificent of the Ottoman Empire in 1554. He remarks in a letter upon seeing "an abundance of flowers everywhere; Narcissus, hyacinths, and those which in Turkish Lale, much to our astonishment, because it was almost midwinter, a season unfriendly to flowers" (see Busbecq, qtd. in Blunt, 7). It is worth mentioning that the words Narcissus (Narges) and Lale (Laleh) originally come from Persian. In Persian Literature (classic and modern) special attention has been given to these two flowers, in specific likening the beloved eyes to Narges and a glass of wine to Laleh. By 1559, an account was given by Conrad Gessner of seeing tulips flowering in the garden of Councilor Herwart in Augsburg, Bavaria. Due to the very nature of the tulip's growing cycle—if the bulbs are to be removed from the ground, it generally occurs in June, and they must be replanted again by September to endure the winter—Busbecq's account of the supposed first sighting of tulips by a European is likely spurious. While possible, it is doubtful that Busbecq could successfully have had the tulip bulbs removed, shipped, and replanted between his first sighting of them in March 1558 and Gessner's description in 1559. After introduction of the tulip to Europe, it is believed to gain much popularity and shown as a sign of abundance and indulgence in the Ottoman Empire. The era which the Empire was wealthiest is called the Tulip era, in Turkish Lale Devri. Another oft-quoted account is that of Lopo Vaz de Sampayo, governor of the Portuguese possessions in India. Having been brought home in disgrace after usurping his position from the rightful governor, Sampayo supposedly took tulip bulbs with him from Sri Lanka. This tale too, however, does not hold up to scrutiny; tulips do not occur in Sri Lanka, and the island itself is far from the route Sampayo's ships should have taken. Regardless of how the flower originally arrived in Europe, its popularity soared quickly. Charles de L'Ecluse (Clusius) is responsible for much of the spread of tulip bulbs in the final years of the sixteenth century. He was the author of the first major work on tulips, finally completed in 1592. Clusius had already begun to note and remark upon the diseased variations in color that made the tulip so admired. His taste for tulips quickly spread to others. While occupying a chair in the medical faculty of the University of Leiden, Clusius planted both a teaching garden and his own private plot with tulip bulbs. In 1596 and 1598, however, Clusius suffered thefts from his garden, with over a hundred bulbs stolen in a single raid. In the Netherlands, in the seventeenth century, the flower became a coveted luxury item and a status symbol. Special breeds were given exotic names or named after Dutch naval admirals. The most spectacular and highly sought-after tulips had vivid colors, lines, and flames on the petals as a result of being infected with the tulip-specific virus known as the tulip breaking potyvirus. During the seventeenth century in the Netherlands, particularly between 1634 and 1637, the early enthusiasm for the new flowers triggered a speculative frenzy, now known as the tulip mania (tulipomania). Tulip bulbs were then considered a form of currency and the demand for tulip bulbs reached such a peak that enormous prices were charged for a single bulb. The Black Tulip by Alexandre Dumas is an historical romance fiction novel set in that time that has a central theme of trying to win a large monetary prize, as well as fame, for being the first grower who can produce a truly black tulip. This fascination with growing a black tulip, a biologically impossible task, was historically accurate to the tulipomania in which the novel is set. The Netherlands and tulips are still associated with one another. The term 'Dutch tulips' is often used for the cultivated forms. Tulip Festivals are held in the Netherlands, Spalding (England) and in North America every May. Tulips are now also popular in Australia, and several festivals are held during September and October in the Southern Hemisphere's spring. The world's largest permanent display of tulips, although open to the public only seasonally, is in Keukenhof, in the Netherlands. Tulips cannot be grown in the open in tropical climates, as they require a cold winter season to grow successfully. Manipulation of the tulip's growing temperature can, however, allow growers to "force" tulips to flower earlier than they normally would. Tulips can be grown in either of two ways: through offsets or seed. Being genetic clones of the parent plant, offsets are the only way to enlarge the stock of a given tulip cultivar. By contrast, tulips do not come true from seed; the mixing of genes between parent tulips is very unpredictable. A tulip grown from seed will usually bear only a passing resemblance to the flower from which the seeds were taken. This makes for great potential in breeding new tulip flowers, and great variation in the wild. However, tulip growers must be patient: offsets often take at least a year to grow to sufficient size to flower, and a tulip grown from seed will not flower for anywhere between five and seven years after planting. "Broken" tulips (tulips affected by the mosaic virus) will occasionally revert to plain "breeder" coloring, but usually maintain their colorful, infected state when grown from offsets. Blunt, Wilfrid. 1950. Tulipomania. Harmondsworth, Eng: Penguin Books. Clusius, C., and W. van Dijk. 1951. A Treatise on Tulips. Haarlem: Printed for the Associated Bulb Growers of Holland, by Joh. Enschedé en Zonen. Dash, M. 1999. Tulipomania: The Story of the World's Most Coveted Flower and the Extraordinary Passions It Aroused. New York: Crown Publishers. ISBN 0609604392. Pavord, A. 1999. The tulip. New York: Bloomsbury. ISBN 1582340137. Pollan, M. 2001. The Botany of Desire: A Plant's Eye View of the World. New York: Random House. ISBN 0375501290. This page was last modified on 21 December 2015, at 19:50.